Torshin, a leading figure in Putin’s party, has been implicated in money laundering by judicial authorities in Spain, as Bloomberg News first revealed in 2016. Spanish investigators alleged in an almost 500-page internal report that Torshin, who was then a senator, capitalized on his government role to assist mobsters laundering funds through Spanish properties and banks, Bloomberg reported. California Sen. Dianne Feinstein, the ranking Democrat on the Senate Judiciary Committee, sent letters in November to two senior Trump foreign policy aides, J.D. Gordon and Sam Clovis, seeking copies of any communications they had with or related to Torshin; the NRA; veteran conservative operative Paul Erickson; Maria Butina, a Torshin protege who ran the Russian pro-gun group he helped launch, and others linked to Torshin. Michelle Goldberg at the New York Times writes, Is This the Collusion We Were Waiting For? 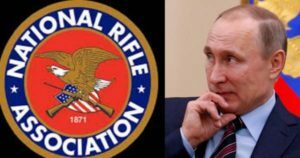 So apparently the NRA under the stewardship of Wayne LaPierre was laundering Russian Mafia/Government money into the Trump campaign? As a gun owner all I can say is for this and all their other sins the NRA needs to “be broken into a thousand pieces & scattered to the winds” (h/t JFK). I believe in gun safety education but the NRA has moved light years away from that. And when LaPierre shuffles off his mortal coil, may he spend eternity being raped by a 12 gauge Mossberg with an endless supply of ammo.